Press Release "Cuts and Scratches"
Some of the greatest songs came out of musicals. I grew up hearing a lot of them sung by of Sinatra, Bennett, Mathis and Cole. On my first album, ‘Black and Blue Suite”, is the song ‘Lead Me On’, the door that opened thinking that one day, I could have a musical called ‘Rhinestone Cowboy’. It took a year to get the story and music where I liked it, and we are in the midst of putting all the elements in place. From the inspiring opening declaration “I Am Somebody” to the reflective closer “Can’t We Start Over Again,” the CD represents an uncommon depth and a commitment to life. It has its share of love songs, but Cuts And Scratches spends more time mining some of the more complex issues in a life well-lived— heritage, honesty, anger, commitment, politics, disappointment and self-reflection. 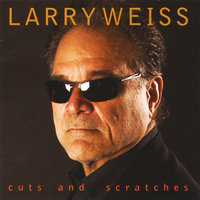 Nashville Arts Magazine wrote an article about Larry Weiss and his new album release “Cuts and Scratches” click on the link below to read the article. Hi! Welcome to RHINESTONE COWBOY! Dave sings Rhinestone Cowboy while driving his Mentos and Coke rocket bike.